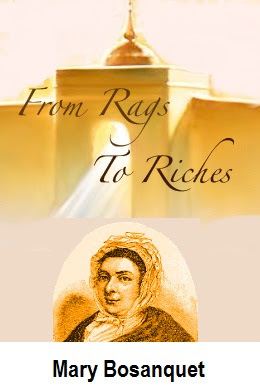 From Rags To Riches In God! Mary Bosanquet was the daughter of a wealthy English merchant. She belonged to the elite. She wore the finest and the most expensive clothes and jewelry. Her father knew all the "right" people. Whatever Mary lacked she only needed to buy. What more could she want? But something like a bombshell soon exploded in the Bosanquet home. Mary was invited to attend meetings held by the Methodist Society. Without telling her father, she went to a service, then more services. Then it happened! Wealthy Mary Bosanquet was converted. She felt as though she were floating on clouds. Oh, the joy of it! She told her father. He was ashamed that she was dropping out to join the Society of Methodists! How cruel, how ungrateful! What was more, Mary invited her brothers to the meetings and spoke to them about their souls! She began to dress plainly like people in the Society of Methodists. That added insult to injury, and one day her father came to her with a demand. "Mary, there is a promise I require of you. That is, that you will never, now or hereafter, try to make your brothers what you call ‘Christian’." Mary replied, "Father, I dare not consent to that." "If you refuse to consent to that, you force me to put you out of my house!" "According to your view of things, I will do." Her father chided, "You don’t appreciate what I provide for you; you wear the plain clothes of those people!" How could poor Mary explain that she really loved her father and appreciated his interest and provision? But she was resolute in her reply: "When I think of the word ‘holiness’, or of the adorable name of Jesus, my heart seems to be on fire for God more than ever before. I cannot go with you any more to places of amusement; neither can I wear the expensive clothes you buy me. I must be God’s and His alone." Imagine a young man or woman being uplifted by the thought of holiness or the name of Jesus! Mary’s father was furious and told her to pack her things. He summoned the family coach and soon Mary, with her belongings in one trunk, literally left home to follow Christ. Her young maid and companion, who was also a Christian, was allowed to accompany her. At the parting, Mary told her father of a promise God had given from Revelation 3:4. "God has promised me that I shall walk with Him in white." Mary was driven to her knees many times, and there she found Jesus, the "fairest of ten thousand". The Lord reminded her with the words of the psalmist: "When my father and my mother forsake me, then the LORD will take me up." (Psalm 27:10) The Lord kept His promise; He never failed her. Mary often said, "Why, I am brought out of the world, and I have nothing to do but to be holy for God: holy in body and in spirit. What a happy soul I am! Truly my abode is a bit of heaven." Prayer meetings were held in Mary’s new home and one woman after another asked to join. Their numbers grew to such proportions that Mary appealed to John Wesley to send them a preacher for Sunday services, which he did. Mary took a number of children into her home, and about thirty adults. They depended wholly on the Lord for sustenance. God, the Father of the fatherless, never failed to supply their needs. Jesus, I my cross have taken. God, and heav’n are still my own!